The Stellwagen Bank National Marine Sanctuary is one of 14 sites in a system of ocean & Great Lakes areas designated as having special national significance. 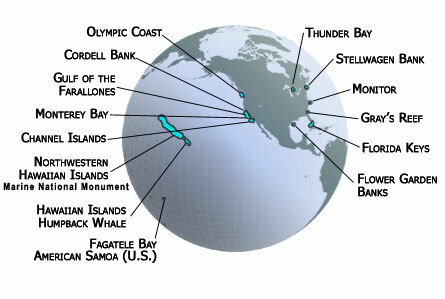 That number includes 13 national marine sanctuaries and the Northwest Hawaiian Islands Marine National Monument. Explore the national program at its web site or its individual components, highlighted here in this world map. The National Marine Sanctuary Program is located within the National Ocean Service of the National Oceanic and Atmospheric Administration. Click on the sanctuary names above to visit their web site.